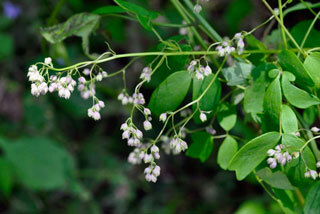 Stems: Erect, branched above, purplish, glabrous or sparsely pubescent. Leaves: Mostly cauline, alternate; petiole present or absent; blade 3-4-ternately compound; leaflets ovate to cuneate or obovate, .6 to 2.2 inches long, .3 to 2 inches wide; margins entire or 2-5-lobed apically; surfaces glabrous or pubescent on the lower surface. Inflorescences: Panicles, 10-200-flowered; involucral bracts absent. Flowers: Usually unisexual, staminate and pistillate on separate plants, rarely bisexual, radially symmetric; sepals 4(-6), white to purplish white, lanceolate, .08 to .16 inch; petals 0; stamens 7-30; pistils 1-16. Fruits: Achene, dark, body ovoid, .12 to .2 inch, ribbed; beak straight, .12 to .16 inch; seed 1. Uses: The ripening fruits have a delicate odor, which Native Americans employed by rubbing them into their clothing. They took an infusion of root to reduce fevers; smoked the dried seeds to bring luck when hunting; and mixed the plant with white clay and applied this compound to the muzzles of horses in order to increase their stamina. Young Native American boys fashioned toy flutes from the hollow stems. A lover seeking to gain the affection of a maiden crushed the inflorescence with spittle in the palm of his hand; if the desired one would accept that hand when proffered for handshaking the suitor's success was thought to be assured. Comments: Thalictrum, name used by Pliny and Dioscorides and dasycarpum, hairy and carpel, alluding to the fruits.